A submarine eruption along the Juan de Fuca Ridge (JDFR) was detected in late June 1993 by the NOAA using hydrophones. Plumes and a lava flow were subsequently identified by research ships along the Coaxial Segment (figure 1), located ~435 km W of the Oregon coast. Figure 1. General plate tectonic map of the NE Pacific Ocean showing the North American, Pacific, Explorer, Juan de Fuca, and Gorda plates. The Coaxial Segment is just N of Axial Volcano along the Juan de Fuca Ridge. Courtesy of Bill Chadwick, NOAA. On 26 June a burst of low-magnitude and low-frequency (1-30 Hz) T-phase seismicity (~31 events in the first hour) was accompanied by what appeared to be harmonic tremor near the terminus of the N rift zone of Axial Volcano (a hot-spot volcano adjacent to the ridge) near 46.23°N, 129.83°W. Activity migrated ~37 km NNE over the next two days, with the final locus of activity near 46.52°N, 129.60°W. Another swarm of events occurred on 4 July; activity then declined to a few minor events/day. All T-phase activity was probably below the threshold of land-based seismometers, mb < 2.5, though some events may have been larger. Real-time monitoring of the Juan de Fuca Ridge by the NOAA Vents T-Phase Project had begun only four days earlier, on 22 June, using the U.S. Navy Sound Surveillance System (SOSUS). The raw data are transferred to NOAA's Newport, Oregon labs, where time-versus-frequency plots for selected locations are continuously displayed and monitored. Scientists aboard the Canadian Survey Ship Tully performed Conductivity-Temperature-Depth (CTD)/transmissometer casts on 1-3 July between 46.20°N and 46.55°N, primarily along the W ridge of a large graben where the NE flank of Axial Volcano merges into the JDFR. A transmissometer is a device that measures the amount of particulate matter in the water by shining a light across a short distance and measuring the amount of light received at the other end. Plumes can be mapped in this way independent of temperature anomalies. Plumes were found along the central axis of the graben, extending between approximately 46.33°N and 46.50°N, in close agreement with the T-phase locations. Strong plumes within several hundred meters of the seafloor (bottom depth ~2,400 m) were detected at 46.50°N, 129.59°W, and there was an intense plume at 1,700-1,800 m depth, at least 700 m above the bottom. On 9 July, the NOAA Ship Discoverer arrived at the site with a full suite of instrumentation, including CTD/transmissometer, chemical scanner, SeaBeam, seafloor volcanic system monitors (rumbleometers), and the Canadian remotely operated vehicle system, ROPOS, equipped with acoustic and differential GPS navigation. The next day, Discoverer's first cast, at 46.50°N, 129.60°W, confirmed the presence of both deep and shallow plumes. Plumes were identified on the basis of thermal and light-attenuation anomalies, as well as large anomalies in dissolved Mn and Fe using a continuously sensing in-situ chemical scanner. Over the next several days, two along-axis, several cross-axis tow-yos, and several vertical CTD casts were completed. The term "tow-yo" describes the process of alternately lowering and raising the CTD instrumentation during the tow, making a saw-toothed survey through the water column. This allows measurement of the upper and lower boundaries of plumes, as well as their lateral extent in two dimensions. The first along-axis CTD tow mapped the large plumes along the segment and above the N swarm area on 12 July. Lower plumes, extending 39 km along the axis from 46.23°N to 46.57°N, were characterized by temperature anomalies as high as 0.07°C centered ~150-200 m above the seafloor; in some places the temperature anomalies extended within 10 m of the seafloor (generally the closest approach height of the CTD). Upper plumes were well-defined by temperature, light-attenuation, and chemical anomalies, with a maximum rise height of ~800 m and a maximum temperature anomaly of at least 0.18°C. The upper plumes were first found near 46.50°N and later near 46.27°N, and appeared to have a distinct layered structure, perhaps indicative of separate injections of hydrothermal fluid. Although these plumes have rise heights and temperatures similar to the megaplumes discovered over the Cleft Segment of the JDFR (~160 km S at 44.5-45.0°N) in 1986 and 1987, their volume appears much smaller, only several kilometers along and across axis. Preliminary results indicate dissolved Mn and Fe anomalies in the upper plumes exceeding those found in the 1986 and 1987 megaplumes. The well-defined N edge of the plumes approximates the extent of the T-phase swarm area. The S boundary of the plumes is more diffuse, but there is a fairly distinct diminishment at about 46.23°N, approximately the boundary of the S swarm. Preliminary analysis of radon-222 in plume samples taken on 12 and 19 July shows a distinct decrease in values for the upper plume, supporting the presumption that they were produced by powerful but short-lived hydrothermal discharges and were not resupplied by continuous venting. Radon-222 estimates for the cessation of the hydrothermal event that produced these upper plumes range from 28 June to 1 July, or 2-5 days after the initial T-phase activity. The lower-plume radon-222 values did not decrease between sampling, indicating that they were sustained by continuous venting in mid-July. The most intense hydrothermal activity was from the center of the axial valley over about 46.52°N. Because of the coincidence between the T-phase swarms and the hydrothermal activity, this area was chosen for detailed study with the remotely operated vehicle ROPOS. The dive traversed the valley floor from E to W and encountered sediment-free, glassy lava on the W-facing slope of a ridge just N of a small, older seamount centered at 46.52°N, 130.59°W. Subsequent traverses over the ENE-oriented lava ridge revealed it to be ~300 m wide and at least 1,500 m long. A 100-m-wide zone centered over the crest was venting warm water through interstices of unfractured pillow and lobate lava flows. Water temperatures were up to 13°C, and the chemical scanner measured high levels of Fe and Mn in the vent fluids. The S end of the lava ridge was within a graben imaged by the ROPOS's Mesotech sonar system. The next ROPOS dive started at the S terminus of the lava ridge and continued S along the trend defined by the ridge crest. An actively venting fracture system was crossed on every subsequent traverse across this trend, extending 6.5 km S to 46.47°N, with water temperatures up to 23°C. The fracture system crosses a lava plateau that bisects the axial valley. Basalt samples from the recent flow are very fresh-looking lobate to pillowed types. Upper glass selvages are up to 2.5 cm thick and are sparsely plagioclase-phyric. The glass selvages have no sediment cover (except in areas of hydrothermal discharge) and exhibit a shiny iridescent surface. Some of the samples have surficial staining (probably elemental sulfur) as the result of contact with hydrothermal fluids. 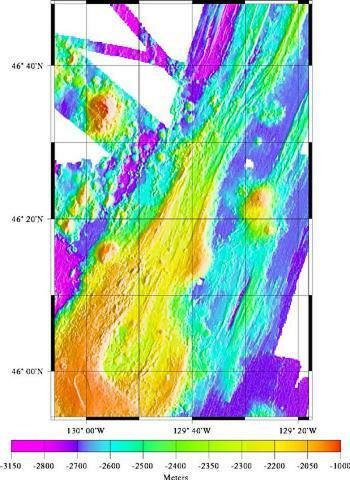 The volcanic zone of the Coaxial Segment between 46.10°N and 46.65°N was resurveyed with SeaBeam multibeam sonar. By the time data collection and analysis were complete, a new lava flow had been located with ROPOS at 46.52°N, 129.58°W. The extent of the new lava flow corresponds very closely to an area of depth change identified between SeaBeam surveys. Comparison of the new survey and the 1981 and 1991 SeaBeam surveys showed a depth change of about 30 m. Onshore processing of the data is still in progress, but no other depth changes had been confirmed by 20 Aug; there could be other new lava flows that are below the detection level of SeaBeam. Except for bacterial filaments, the young lava flow was devoid of sessile organisms, whereas adjacent old lavas hosted many non-vent animals. Information Contacts: C. Fox, W. Chadwick, R. Embley, and R. Dziak, NOAA Vents T-phase Project. The Global Volcanism Program has no Weekly Reports available for CoAxial Segment. The CoAxial segment of the Juan de Fuca Ridge is located about 435 km west of the Oregon coast, NE of Axial volcano. A submarine eruption along the CoAxial segment that produced thermal plumes and a new lava flow was detected by acoustic hydrophones in June 1993, just days after installation of the hydrophone system. This marked the first deep-sea volcanic eruption that was detected as it was happening. The location of the eruption was at a depth of about 2400 m, about 37 km NE of Axial volcano. Bathymetric surveys indicated that one or more additional sea-floor lava extrusions took place immediately to the east of the 1993 lava flow sometime between 1981-82 and 1991. Chadwick W W Jr, Embley R W, Fox C G, 1995. SeaBeam depth changes associated with recent lava flows, CoAxial segment, Juan de Fuca Ridge: evidence for multiple eruptions between 1981-1993. Geophysical Research Letters, 22: 167-170. There is no Deformation History data available for CoAxial Segment. There is no Emissions History data available for CoAxial Segment. The linear NE-SW-trending CoAxial segment (center) of the Juan de Fuca Ridge is located about 435 km west of the Oregon coast. It lies NE of Axial volcano, which is visible at the bottom left of this map. A submarine eruption along the CoAxial segment that produced thermal plumes and a new lava flow was detected by acoustic hydrophones in June 1993. Bathymetric surveys indicated that one or more additional sea-floor lava extrusions took place nearby sometime between 1981-82 and 1991. When the ROPOS ROV (Remotely Operated Vehicle) was used to dive on this site at the CoAxial Segment along the Juan de Fuca Ridge, a brand new lava flow was discovered on the sea floor. The new lava flow was still hot and venting warm water (up to 50°C) and is 2.5 km long and 300 m wide. 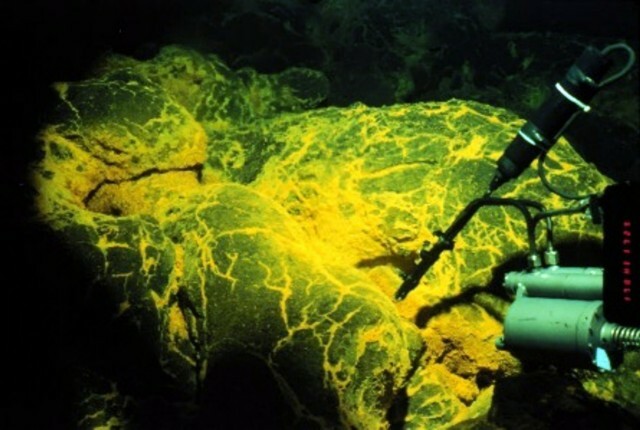 Bright yellow sediment patches on the new 1993 lava indicated the presence of iron-reducing bacteria in the vent fluids. The CoAxial segment is located about 435 km west of the Oregon coast, NE of Axial volcano. The Global Volcanism Program has no maps available for CoAxial Segment. There are no samples for CoAxial Segment in the Smithsonian's NMNH Department of Mineral Sciences Rock and Ore collection. IRIS seismic stations/networks Incorporated Research Institutions for Seismology (IRIS) Data Services map showing the location of seismic stations from all available networks (permanent or temporary) within a radius of 0.18° (about 20 km at mid-latitudes) from the given location of CoAxial Segment. Users can customize a variety of filters and options in the left panel. Note that if there are no stations are known the map will default to show the entire world with a "No data matched request" error notice. Large Eruptions of CoAxial Segment Information about large Quaternary eruptions (VEI >= 4) is cataloged in the Large Magnitude Explosive Volcanic Eruptions (LaMEVE) database of the Volcano Global Risk Identification and Analysis Project (VOGRIPA).